Club were looking to avenge a 4-0 defeat on the opening day of the season and looked on course to do so when they went 2-0 up inside the opening half hour. 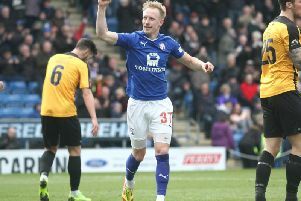 They broke the deadlock when Marc Newsham turned the ball in for his fourth goal in as many games, and doubled the lead just before the half-hour mark when Leon Osborne netted. Marske were back in the game three minutes later through a Damien Stevens header but Club restored their two-goal lead whensubstitute Waide Fairhurst finished well. Glen Butterworth gave Marske a lifeline with a neat lob over Ross Durrant and just when it looked as if Gavin Smith’s men had hung on, the visitors grabbed an equaliser deep into stoppage time as Adam Wheatley found space to stab home cross from close range. Stocksbridge Park Steels slumped to a disappointing 2-0 defeat at Pontefract Collieries. Steels were behind after just five minutes as Michael Dunn got in on goal to clip a shot over Jordan Greaves. Chris Hilton’s side had a great chance to equalise just before the interval when Aaron Moxam got a clear sight of goal - only to be denied by a excellent save from the home shot-stopper Ryan Musselwhite. The home side had the ball in the net again at the start of the second half but the goal was ruled out for offside. Stocksbridge had another chance to draw level on 50 minutes only for Luke Mangham to blaze his shot over the bar. Pontefract though finally wrapped up the points five minutes from time with the second through a great 20-yard strike from Eli Hay that gave Greaves no chance. Staveley MW caused a huge FA Cup upset, dumping out Evo-Stik Premier Division side Basford United 3-1 in their own backyard. The Trojans were 1-0 up inside the opening five minutes through a Adam Baskerville penalty for handball, which saw Matt Thornhill sent off. Baskerville then made it 2-0 midway through the first period and although Basford reduced the deficit on 68 minutes, Liam Greenfield headed a third for Staveley five minutes later. The home side were down to nine men for the last 10 minutes after Nat Watson was dismissed. Former Maltby Main manager Spencer Fearn made a triumphant return to Muglet Lane as his Frickley Athletic side edged a hard fought tie 2-1. The match was streamed live by the BBC in front of a record Maltby crowd of 504, as the Miners were beaten for the first time in nine games. Frickley edged in front on 21 minutes from the penalty spot, Tyler Walton sending James Pollard the wrong way, but the Miners hit back to equalise six minutes later, Will Eades with a fine header from a free-kick. The goal that proved decisive arrived with 16 minutes remaining, Richard Patterson poking home at the far post. Worksop Town bowed out 5-2 at Evo Stik side Nantwich Town. Connor Brunt had given the Tigers hope volleying in a 28th minute equaliser. The host were 4-1 up though just past the hour and although Thomas Poole got one back on 82 minutes it proved no more than a second consolation effort with Nantwich scoring a late fifth. In the Toolstation NCEL, Handsworth Parramore bounced back to winning ways, coming from behind to beat Albion Sports 4-2 to end a run of four matches without a win. Hallam won 3-2 at Selby Town but were left hanging on in a game they looked to had wrapped up inside the first half, with goals from Mitch Husbands and Sam Smith's double. Penistone Church completed a quickfire cup and league double over Harrogate Railway, running out 3-0 winners just four days after dumping their hosts out of the League Cup. Athersley Recreation ended a run of six defeats on the spin in all competitions with a shock 2-1 win at Bridlington Town. Adam White gave Rec a first half lead with Lee Garside hitting the winner on 70 minutes shortly after the hosts had levelled. Dronfield Town climbed to fourth in Division One coming from behind to beat FC Bolsover 5-2 to make it five wins on the spin. Jake Morrison fired Bolsover into a second minute lead but but a brace for both Callum Mawbey and Mark Fereday along with an effort from Ashley Rawson had Dronfield 5-1 up just before the hour. The game was held up for around 30 minutes after Bolsover goalkeeper Matty Leese suffered a suspected broken leg. When play did resume Reece Lucas got one back but the concerns were for Leese by that time. Harworth Colliery twice came from a goal down to beat East Yorkshire Carnegie 5-2 an end a run of three defeats on the spin, while Worsbrough Bridge Athletic made it four wins in a row after coming from behind to beat Shirebrook Town 2-1 with goals from David Taylor and Fidel Mhlolo. Fixtures, tomorrow: Evo Stik League Premier Division: Bamber Bridge v Buxton. East Division: Cleethorpes Town v Sheffield FC, Stocksbridge Park Steels v Carlton Town. Sheffield & Hallamshire Senior Cup First Round: Hemsworth MW v Worksop Town. WEDNESDAY, Toolsation NCEL: Premier Division: Athersley Recreation v Maltby Main. FA Cup First Qualifying Round: Parkgate v Leek Town.